Knee pain is a common reason that people visit their doctors’ office or the emergency room. In many cases, an injury to the knee, such as a ruptured ligament or torn cartilage, causes substantial pain. Yet, there are some medical conditions that cause knee pain that are not the direct result of an injury. 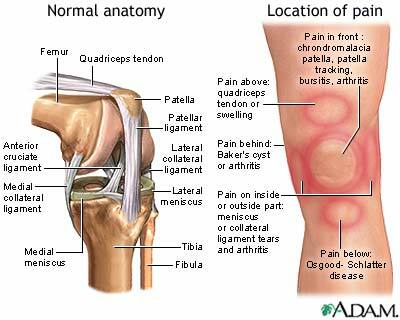 Knee pain can also be caused by conditions such as arthritis, gout and infections. Someone suffering with chronic knee pain will experience severe pain and discomfort when they kneel or exercise. Others suffering with knee pain may only experience minor pain. It all depends on the type and severity of the damage to the knee. Treatment for knee pain all depends on the root problem causing the pain. Therefore, the first step in treatment is to have a thorough exam by a skilled physician. Imaging studies, such as an MRI, may be a part of that exam. Self-healing measures, such as muscle strengthening exercises, can help many relatively minor instances of knee pain. Cortisone injections or Visco Supplementation injections may provide short-term relief. The use of Cold Laser Therapy can help the knee heal itself more quickly. The use of Platelet Rich Plasma (PRP) and/or Stem Cell therapy can rapidly boost healing in the knee and may help regenerate the joint tissues. For patients that continue to suffer after these non-surgical methods, surgical repair may be an option. If you continue to suffer with chronic knee pain and your current treatment plan leaves you wanting more options, perhaps a fresh set of experienced eyes can change your outlook. Since 1990, Dennis M. Lox, M.D has applied his personal interests in sports medicine and chronic pain management to helping patients in the Tampa Bay area increase their quality of life by reducing their pain. Contact us for an appointment at 727-462-5582.